General Hamidu Laanigri, the director-general of Moroccan security, last month told the French newspaper Le Figaro that Morocco did not produce terrorism. As far as the Moroccan authorities are concerned, the fact that many of those involved in major terrorist attacks against Western targets over the past year were Moroccans did not reflect ingrained fundamentalism in the kingdom. The bombings in Casablanca on May 16, 2003, and in Madrid last March 11, were both carried out almost entirely by Moroccan men. This fact is hard to swallow in a country that prides itself on its tolerant Islamic traditions and actively promotes itself as something of an exception within the Arab world. Morocco is proud of its long-settled Jewish minority and the mystical elements of the country's Malikite form of Sunni Islam. Under King Mohammed VI, who inherited the throne from his authoritarian father, Hassan II, in 1999, Morocco is attempting to reinvent itself politically and internationally. Rabat is about to sign a free-trade agreement with the US, and has joined Egypt, Jordan and Bahrain as a non-NATO special ally of the superpower. Domestically, there have been tentative steps taken in recent years toward genuine democracy, including fairer elections, greater linguistic and cultural freedoms, the investigation of past human rights abuses and the legalization of a major Islamist political grouping, the Justice and Development Party (PJD). The PJD is a moderate Islamist group that accepted the conditions of being legalized: respecting the constitution, pluralism and the role of the king as amir al-muminin (commander of the faithful). The PJD is today, in effect, the official opposition as it is the only major parliamentary force that is not part of the coalition government led by the technocrat Driss Jettou. Another Islamist group, the Justice and Charity movement, led by Sheikh Salam Yassin, is potentially an even greater force in Moroccan politics. It has strong grass-roots support among the poor and religious conservatives, but it lives in the shadows, semi-tolerated but not an electoral force, as it does not accept the connection between the monarchy and religion. There is no evidence, however, that either the PJD or Yassin support violence. In Casablanca last May, 45 people - including 12 suicide bombers - were killed in attacks against restaurants, a hotel and a Jewish cemetery. At first, the authorities suspected it had been the work of outsiders, but, once identified, the suicide bombers turned out to be Moroccans - most from a desperately poor suburb of Casablanca known as Sidi Moumen. 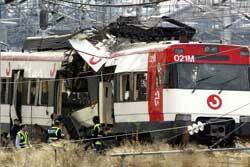 Then came the killing of 191 people in 10 simultaneous bomb explosions on the Madrid passenger trains. There is truth in what the Moroccan government's official spokesperson, Nabil Benabdallah, said afterwards: "The terrorist attacks on Madrid were prepared in Europe and people of various nationalities, not just Moroccans, participated in them." Nevertheless, most of the suspects were Moroccan. To date, 12 out of 14 people detained in Spain in connection with the bombings are Moroccan, as were five out of the seven men who blew themselves up soon afterwards rather than be arrested. One was a Tunisian, while another has yet to be identified. The attacks in Madrid have brought to light the size and complexity of the organizations of terrorists and sympathizers stretching between Morocco and Spain. The post-March 11 investigation focused on the Moroccan Islamic Combatant Group (MICG). Of those imprisoned in Spain, Jamal Zougam is considered to be the most likely ringleader - and is said to have connections with the MICG. Zougam's history of radical Islamist activity in Spain is thought to go back to a pre-September 11, 2001 cell in the country led by a Syrian, Imadeddin Barakat Yarkas, alias "Abu Dahdah." Yarkas is currently awaiting trial in Spain on charges of taking part in the Sept. 11 plot. It appears that Islamist terrorists groups originally used Spain as a convenient place for sleeping cells to organize discreetly. Some of the final details for the Sept. 11 hijackings, including the provision of stolen passports, were finalized in Spain, notably during the so-called "Tarragona summit" between hijacker Mohammed Atta and Al-Qaeda coordinator Ramzi Binalshibh in July 2001. After Sept. 11, 40 Al-Qaeda suspects were arrested in Spain, 12 were later charged and are still in custody. Most of the Moroccans arrested since March 11, including Zougam, used to attend the Al-Quds mosque in Tangiers to hear the preaching of Mohammed Fizazi, himself condemned to 30 years for inspiring the Casablanca attacks. Much of the information about the MICG that has emerged since March points toward a general failure by the Moroccan security forces to locate the true organizers of Islamist terrorism among its population. The Moroccan authorities have been zealous in locking up alleged Islamists. Over 2,100 have been tried in the year since the Casablanca attacks, leading to 903 convictions, with 17 of those convicted given the death penalty (so far commuted). However, the manner in which the authorities have suddenly found cells of so-called Salafiyya Jihadiyya, or Jihadist Salafists, up and down the kingdom, not to mention the death in custody of the one terrorist caught red-handed, looks less like a counter-terrorism operation than a political purge. According to Mohammed Darif, a professor of political science at Mohammedia University in Morocco: "There are strong ties between the attacks in Casablanca and Madrid. They were carried out by the same organization, linked to Al-Qaeda, the MICG." Darif is concerned that people caught in the rounding-up of militants from the Salafiyya Jihadiyya and other organizations have been sentenced "for acts that they might not have perpetrated." The man suspected of being the MICG's leader, Abdel Karim Thami Mejjati, is wanted by Moroccan and Spanish police in connection with the Madrid attacks. The Moroccan government has also launched a legislative offensive against what it perceives to be the bases of extremism. Until recently, 37 percent of mosques were independent of central authority, but will now come under direct governmental supervision. Religious guides have been introduced into army regiments and a body has been set up to examine the religious content of textbooks used in schools. Mohammed al-Boukili of the Moroccan Association of Human Rights says the reforms are "a bit late," and points to "a certain laxity over the past 18 years" in the control over mosques and school materials by the Ministry for Religious Affairs. The government has also been able to revive its long-cherished reform of the family status code, which involves raising the age of marital consent to 18, replacing repudiation with divorce and giving men and women legal equality as parents. The law was passed unanimously earlier this year with barely a murmur from the PJD. Three years ago, similar proposals had brought a million demonstrators onto the streets of Casablanca.